Geek Goddess: Would you jump down a manhole for YOUR MAN? 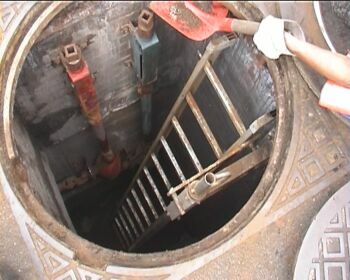 Would you jump down a manhole for YOUR MAN? Call me cheap but free movies are welcome anytime. The trailer itself tells of what an enchanting movie it will be. And it gets 5 popcorns from your truly. Apart from the smashing company there, the movie was breathtaking!!! Shimei, Raine, Isaac, Skyler, Huiwen, Glenn (her very charming bf) and Esther managed to catch this show compliments of the Nuffnang team. Being the kiasu we were, I had gone super duper early to "chope" a whole row of seats so other that assuring ourselves good seats, we had enough to go around, so much so that Wendy (xiaxue), Stanley and gf (evelyn aka blackhighheels) as well as Jiawen and her gang could share the row with us. Basically the fairytale romance takes place in midtown Manhattan, where characters from the fairytale get zone warped into reality and learn how imperfect this world we live in is. How totally opposite the real world is from the utopic picture painted in disney's lala land. Ooohhh and what I really like about Disney movies is their ever-lovable sidekick characters (thinkn puss in the boots from the Shrek Movie!). 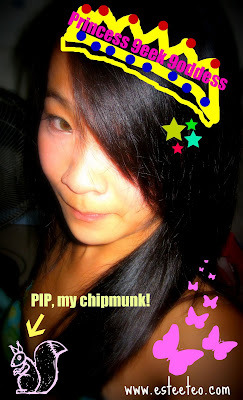 I love PIP, the chipmunk in "The Enchanted"!! I love the way it talks and attempts to save the princess!!! soooo cute la! The show ends with a twist (I'm not revealing twists here) and we realise that love can happen even in this mired world we live in today, despite the hustle and bustle of busy city live, no one can do without a hand to hold and a warm family to call their own. Great date movie, good time to creep your hand over and hold you gf/bf/date's hand... will make you go "awwwwwwww" as well as provide you with an endless string of laughter. sure after ur exam~ we shall go movie too! ha.. ask huiwen, nadia, kexin go too~ the more the merrier~ woohoo~!! i thought so too. vaguely like nelly furtado.. too bad she didn't sing.. the movie sure makes one humming on the way out~ =) cool! thanks to u n nuffnang! :) Thanks for coming babe! Hope to hang out again after my stinkin' exams! xoxo! make sure you don't have high heels on!